Birth. Ca. 1238/1239, Toledo. Of a noble family from Toledo of Mozarabic origin. Son of Pedro Juanes, mayor of Toledo, and Teresa Juanes Ponce. His first name is also listed as Gonzalve; as Gundisalvus; and as Consalvi; and his last name as García Gudiel; as Garcias de Gudiel, Roderici; as de Aguilar e Hinojosa; as Innojosa; as Pétrez (or Pérez) Gudiel; and as Rodríguez de Hinojosa. Education. Studied at the University of Paris from 1259; obtained a master's in arts; he probably was in Paris as part of the entourage of Infante Sancho of Castilla, future King Sancho IV, son of King Alfonso X el Sabio. Early life. Rector of the University of Padua in 1260. He went to Rome and resided there two years. Canon of the cathedral chapter of Burgos. Dean of the metropolitan cathedral chapter of Toledo in 1262; went back to Castilla. Royal notary for Castilla in 1270. He had received the minor orders at the time of his promotion to the episcopate. Episcopate. Elected bishop of Cuenca in 1272. Consecrated (no information found). Transferred to the see of Burgos, September 27, 1275. Promoted to the metropolitan see of Toledo, May 3, 1280; occupied the see until his promotion to the cardinalate; he was succeeded in the see of Toledo by his nephew Gonzalo Palomeque. Chancellor of Castilla and Andalucía in 1280. Pope Nicholas IV named him preacher of the Crusade and ordered him to convoke a provincial council, which was never celebrated. He was a loyal friend of King Alfonso X and of his son, King Sancho IV; he performed the marriage of this latter monarch and Doña María de Molina; and in 1284, he crowned them in the cathedral of Toledo; later he attended the testament, illness, death and burial of the king in the same cathedral. In 1285, he received the title of primate of the Spains. He founded the Estudios de Escuelas Generales de Alcalá de Henares on May 20, 1293. After the death of King Sancho IV in 1295 and the accession of King Fernando IV, the archbishop's situation in Castilla became somewhat difficult. Sometime later, in 1296, the new Pope Boniface VIII called him to Rome to explain his conduct concerning the election of the bishop of Palencia. He was involved in the redaction of the Partidas; and at his request, the work of Averroes De substancia orbis was translated. Cardinalate. Created cardinal bishop of Albano in the consistory of December 4, 1298. Death. December 1299, Rome. Buried, temporarily, in the patriarchal Liberian basilica, Rome (1); in 1301, during the episcopate of his nephew, his remains were transferred to Toledo by the archdeacon of Madrid, Ferrán Martínez (2), and buried in front of the altar of Santa María la Blanca, in the choir of the metropolitan cathedral of that city. Bibliography. Cardella, Lorenzo. Memorie storiche de' cardinali della Santa Romana Chiesa. Rome : Stamperia Pagliarini, 1793, II, 55; Chacón, Alfonso. Vitæ, et res gestæ Pontificvm Romanorum et S. R. E. Cardinalivm ab initio nascentis Ecclesiæ vsque ad Vrbanvm VIII. Pont. Max. 2 volumes. Romae : Typis Vaticanis, 1677, II, col. 328; "Essai de liste générale des cardinaux. Les cardinaux du XIIIè siècle". Annuaire Pontifical Catholique 1929. Paris : Maison de la Bonne Presse, 1929, p. 136; Eubel, Conradus and Gulik, Guglielmus van. Hierarchia Catholica Medii Aevi. Volumen I (1198-1431). Münich : Sumptibus et Typis Librariae Regensbergianae, 1913; reprint, Padua : Il Messagero di S. Antonio, 1960, pp. 12, 34, 151, 200 and 487; Hernádez, Francisco J. ; Linehan, Peter. The Mozarabic Cardinal: The Life and Times of Gonzalo Pérez Gudiel. Tavarnuzze (Firenze) : SISMEL edizioni del Galluzzo, 2004. (Millennio medievale ; 44; Strumenti e studi ; n.s. 5; Variation: Millennio medievale. ; Strumenti e studi ; n.s. 5); Riu y Cabanas, Ramón. "Primeros cardenales de la sede primada", Boletín de la Real Academia de la Historia, (Madrid), XXVII (1896), 141-143; Rivera Recio, Juan Francisco. Los Arzobispos de Toledo en la Baja Edad Media (S. XII - XV). Toledo : Diputación Provincial, 1969, (Publicaciones del Instituto Provincial de Investigaciones y Estudios Toledanos; Serie segunda ; Vestigios del pasado ; v. 3), p. 67-69. Webgraphy. Biography by Ramón Gonzálvez Ruiz, in Spanish, DB~e, Diccionario Biográfico Español; brief biographical data, in Spanish; portrait and biography, in Spanish; Una familia que dejó huella en el arte Toledano: El linaje de Esteban Illan, de Illan Pétrez a Gonzalo Pétrez Gudiel by Balbina Martínez Caviró, Revista Virtual de la Fundación Universitaria Española, Cuadernos de Arte e Iconografía, Tomo V-10. 1992; and his tomb, patriarchal Liberian basilica, Rome. (2) In the prolog of what is considered the first novel in Castillian, El caballero Zifar, appears the story of the translation of the remains of the cardinal. Birth. (No date found), Orvieto. His first name is also listed as Thierry. Nephew of the bishop of Piazcenza. Early life. Prior of the monastery of S. Andrea, Orvieto, ca. 1275. 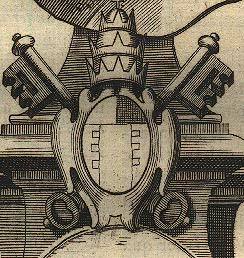 Canon of the cathedral chapter of Città Nova. Auditor of the Sacred Roman Rota. Sent by Pope Martin IV to Germany as a collector. Chaplain of Pope Martin IV. Episcopate. Elected archbishop of Pisa, September 20, 1295. Consecrated (no information found). Cardinalate. Created cardinal priest of S. Croce in Gerusalemme in the consistory of December 4, 1298. Opted for the order of cardinal bishops and the suburbicarian see of Palestrina, June 13, 1299. Camerlengo of the Holy Roman Church in 1300. Captain general of the province of the Patrimonio in 1300. Fiduciary and counselor of Pope Boniface VIII before the commune of Orvieto. Subscribed the papal bulls issued on February 16, 1302. During his episcopate, Palestrina was destroyed and he rebuilt it at his own expense. Participated in the conclave of 1303, which elected Pope Benedict XI. Subscribed the papal bulls issued on March 13, 1304. Participated in the conclave of 1304-1305, which elected Pope Clement V. He brought to Avignon the tiara of Pope Clement V.
Death. December 7, 1306, France. Buried (no information found). Bibliography. Cardella, Lorenzo. Memorie storiche de' cardinali della Santa Romana Chiesa. Rome : Stamperia Pagliarini, 1793, II, 55-56; Chacón, Alfonso. Vitæ, et res gestæ Pontificvm Romanorum et S. R. E. Cardinalivm ab initio nascentis Ecclesiæ vsque ad Vrbanvm VIII. Pont. Max. 2 volumes. Romae : Typis Vaticanis, 1677, II, col. 328-329; "Essai de liste générale des cardinaux. Les cardinaux du XIIIè siècle". Annuaire Pontifical Catholique 1929. Paris : Maison de la Bonne Presse, 1929, p. 136; Eubel, Conradus and Gulik, Guglielmus van. Hierarchia Catholica Medii Aevi. Volumen I (1198-1431). Münich : Sumptibus et Typis Librariae Regensbergianae, 1913; reprint, Padua : Il Messagero di S. Antonio, 1960, pp. 12, 37, 41, and 400. Webgraphy. His arms and biographical data, in Italian. Birth. 1240, in contrada S. Bartolomeo, Treviso. Son of Boccasio, a notary, and Berarda; after his death, the family was a in difficult situation and she had to work as a domestic. His last name is also listed as Boccasio and Boccasino. Education. Studied under his uncle, curé of S. Andrea. Entered the Order of Preachers (Dominicans) in 1254. Studied in Milan, 1262-1267. Early life. Preceptor in Venice before entering the religious life. Priesthood. Ordained (no further information found). Magister in theology. Professor of theology in Venece; in Treviso, 1276; and in Gieoa, 1280, where he was also sub-prior; he wrote commentaries on the Psalms, Job, St. Matthew and Revelation. Prior of the convent in Treviso. Provincial in Lombardy in 1286 and 1293; between those periods, he was again prior in Treviso. Elected 9th master general of his order in the general chapter celebrated in Strassbourg on May 12, 1296; occupied the post until January 14, 1299; he strongly maintained the legitimacy of Pope Boniface VIII, which was questioned by Cardinals Giacomo and Pietro Colonna (who were excommunicated) and the Franciscan Spirituali. In January 1297, he was named legate, together with Fr. Giovanni de Murro, minister general of the Franciscans, to obtain the peace between Kings Philippe IV le Bel of France, Edward I of England, and Flanders. Cardinalate. Created cardinal priest of S. Sabina in the consistory of December 4, 1298; arrived in Rome on March 25, 1299. Together with Cardinal Gentile Partino, O.F.M., he was charged by the pope to solve the problem of the distance that needed to exist between between the churches of the Friars Minor and the Dominicans; the peaceful solution that they proposed on July 28, 1300 was ratified by the new Pope Benedict XI (Cardinal Boccasini) on December 5, 1303. Episcopate. Opted for the order of cardinal bishops and the suburbicarian see of Ostia e Velletri, March 2, 1300. Consecrated (no information found). Subscribed a papal bull dated October 2, 1300. On May 13, 1301, he was named legate in Hungary to support the access to the throne of Carlo-Roberto (Caroberto d'Anjou), son of King Carlo II of Sicily (1); left for his legation the following June 22; on his way to Hungary he consecrated the Dominican church of Saint Augustine in Padua; his mission was unsuccessful and he retired to Vienna in June 1302; on his way to Rome, he left in Treviso the sum of twenty five thousand fiorini for the construction of the church of S. Niccolò of the Dominican friars; returned to Rome on May 10, 1303; he was also legate in Poland, Dalmatia, Croatia, Denmark, Serbia, and France. He was in Anagni on September 7, 1303 when Pope Boniface VIII was captured by Guillaume de Nogaret during the fight between the pontiff and the French King Philippe IV le Bel. Participated in the conclave of 1303 and was elected pope. Papacy. Elected pope on October 22, 1303. Took the name Benedict XI. Crowned in St. Peter's basilica on October 27, 1303 by Cardinal Matteo Rosso Orsini, protodeacon of S. Maria in Portico. He created two cardinals in two consistories. Death. July 7, 1304, of dysentery (poisoning was also suspected), Perugia. Buried in front of the altar of the Dominican convent in Perugia; Cardinal Nicolò da Prato erected his monument. Beatification. He was venerated by the faithful soon after his death; he was beatified by Pope Clement XII on April 24, 1736 by confirming his veneration ab immemorabili; his veneration was was extended to the Venetian Republic by Pope Benedict XIV in 1748. His feast is celebrated on July 7 in the Roman Martyrology and pro clero romano. Bibliography. Benedetto XI, frate, predicatore e papa. A cura di Marina Benedetti. Milano : Biblioteca francescana, 2007. Note: Selected papers presented at a conference held at the Universitá degli Studi di Milano, June 16-17, 2004; Cardella, Lorenzo. Memorie storiche de' cardinali della Santa Romana Chiesa. Rome : Stamperia Pagliarini, 1793, II, 58-59; Chacón, Alfonso. Vitæ, et res gestæ Pontificvm Romanorum et S. R. E. Cardinalivm ab initio nascentis Ecclesiæ vsque ad Vrbanvm VIII. Pont. Max. 2 volumes. Romae : Typis Vaticanis, 1677, II, col. 332 and 339-354 ; "Essai de liste générale des cardinaux. Les cardinaux du XIIIè siècle". Annuaire Pontifical Catholique 1929. Paris : Maison de la Bonne Presse, 1929, p. 136; Eubel, Conradus and Gulik, Guglielmus van. Hierarchia Catholica Medii Aevi. Volumen I (1198-1431). Münich : Sumptibus et Typis Librariae Regensbergianae, 1913; reprint, Padua : Il Messagero di S. Antonio, 1960, pp. 13, 36 and 46; Ilari, Annibale. "Benedetto XI, papa, beato." Mondo vaticano. Passato e presente. Città del Vaticano : Libreria Editrice Vaticana, 1995, p. 131; Kelly, John Norman Davidson. The Oxford Dictionary of Popes. Oxford ; New York : Oxford University Press, 1986, pp. 210-212; Walter, Ingeborg. "Benedetto XI, beato." Enciclopedia dei papi. 3 vols. Roma : Istituto della Enciclopedia italiana, 2000, II, 493-500. Webgraphy. Biography, in English; biography, in English (Britannica); biography, in German; biography, in Italian; portraits and biography, in Italian; portrait and biography, in Italian; biography, in Italian; biography, in Norwegian; "Il primo Papa Veneto" by Caterina Pallaoro, ABCVeneto.com, numero 3, anno primo - 1 giugno 2004 giornale online gratuito (a 30 giorni); "A discontinuous "continuum'" by Lorenzo Cappelletti, 30Days in the Church and in the world, No. 11 - 2005; Studi sul pontificato di Benedetto XI. Lettura critica della sua politica ecclesiastica by Vito Sibilio, The Vatican Files.net, 2003; "Benoît XI avant son pontificat" by Charles Grandjean, Mélanges d'archéologie et d'histoire, VIII (1888), no. 8, pp. 219-291; Une relation inédite de l'attentat d'Anagni by Kervyn de Lettenhove, Revue des questions historiques, Janv. 1872, Année 6, T. 11, pp. 511-520; his portrait by an anonymous artist, 17th century, (formerly attributed to Niccolo Circignani, 16th century), Musée des Beaux-Arrts, Chambéry, France; his portrait as a cardinal, on a fresco, former Domincan convent, Treviso; his portrait as a pope, on a fresco, former Domincan convent, Treviso; his portrait, basilica of S. Maria sopra Minerva, Rome; his effigy on a medal, Numismatic collection of the Olomouc archiepiscopate, Czech Republic; his tomb, Dominican convent, Perugia; his jascent statue in his tomb; his engraving, Biblioteca dell'Archiginnasio, Bologna; his engraving, Deutsche Fotothek, Dresden; his engraving, as a cardinal; his engraving, as a pope; his arms; and another view of his arms. (1) There were to aspirants to the Hungarian throne, Caroberto and Wenceslaus III of Bohemia. In 1305, Wenceslaus renounced his claim to the crown on behalf of Duke Otto III Wittelsbach of Bavaria; Otto was disputably king of Hungary as Béla V from 1305 to 1307, when he left Hungary. Birth. Ca. 1250, Siena. Of a noble and rich family. He is also listed as Ricardus Petronius. Education. Studied law at the University of Bologna. Condisciple of Duns Scot. Early life. Professor of civil law in Naples from the 1270s. Vice-chancellor of the Holy Roman Church, 1296 to 1300 or beginning of 1301. He was a renowned jurist. Collaborated in the composition of the Liber Sextus of Decretales. Cardinalate. Created cardinal deacon of S. Eustachio in the consistory of December 4, 1298. Subscribed a papal bull dated March 14, 1304. Entered the conclave of 1304-1305, which elected Pope Clement V, but had to leave because of illness. Attended the Council of Vienne, 1311-1312, and defended the memory of Pope Boniface VIII against the calumnious accusations of King Kings Philippe IV le Bel of France. Legate of Pope Clement V in Genoa. He built numerous public monuments in his native city as well as a Carthusian monastery. Death. February 10, 1314, Genoa, during his legation. Four years later, his remains were taken to Siena and buried in a tomb built by Tino di Camaino in the cathedral. Bibliography. Cardella, Lorenzo. Memorie storiche de' cardinali della Santa Romana Chiesa. Rome : Stamperia Pagliarini, 1793, II, 61-62; Chacón, Alfonso. Vitæ, et res gestæ Pontificvm Romanorum et S. R. E. Cardinalivm ab initio nascentis Ecclesiæ vsque ad Vrbanvm VIII. Pont. Max. 2 volumes. Romae : Typis Vaticanis, 1677, II, col. 331; "Essai de liste générale des cardinaux. Les cardinaux du XIIIè siècle". Annuaire Pontifical Catholique 1929. Paris : Maison de la Bonne Presse, 1929, p. 136; Eubel, Conradus and Gulik, Guglielmus van. Hierarchia Catholica Medii Aevi. Volumen I (1198-1431). Münich : Sumptibus et Typis Librariae Regensbergianae, 1913; reprint, Padua : Il Messagero di S. Antonio, 1960, pp. 13 and 49. Webgraphy. Biography, in Italian; biographical entry, in English, under "Ricardus Petronius"; his tomb by Tino da Camaiano in the cathedral of Siena, Italy; and detail of his tomb.